A few years ago Nerf decided the best way to lure teens away from paintball and back to its foam darts was with a new line of blasters capable of firing tiny foam balls at speeds of up to 70 miles per hour. The latest addition to that line is the formidable Nemesis MXVII-1oK which comes with a massive 100-shot hopper that keeps you blasting away for almost half a minute. 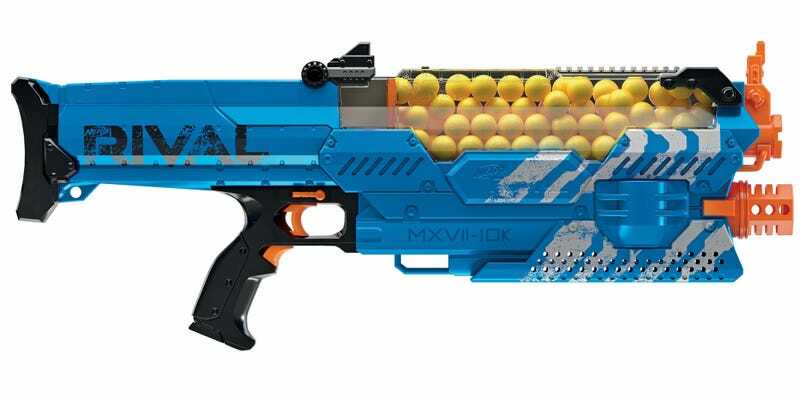 Powered by six D-sized batteries, or a Nerf-branded rechargeable battery pack, the fully-automatic Rival Nemesis MXVII-1oK no longer requires you to carefully reload a clip by inserting those tiny foam balls one-by-one. Instead, you can now just quickly dump them all into a capacious 100-round hopper, which also allows you to continuously reload while you’re still pulling the trigger and firing shots. Available sometime in the Fall for $100, the Nerf Rival Nemesis MXVII-1oK will continue the red versus blue color scheme, and includes 100 foam rounds so you can jump into battle as soon as you tear open the box, and scrounge up all those batteries you’ll need.